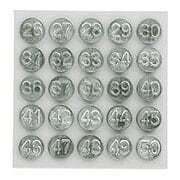 Make your seasonal storm and screen window maintenance a breeze with numbered tacks. These premium quality reproduction Acro numbering tacks let you easily match screen or storms to the right window frame. Easy to install, made of the original "white brass" alloy. Premium quality reproduction of Acro numbering tacks made of the original "white brass" alloy. Large, easy to read 1/2" diameter head with 5/16" long barbed pyramid nail.